Last week I shared a few recipes for Thanksgiving appetizers and sides from Pinterest that I've been drooling over. 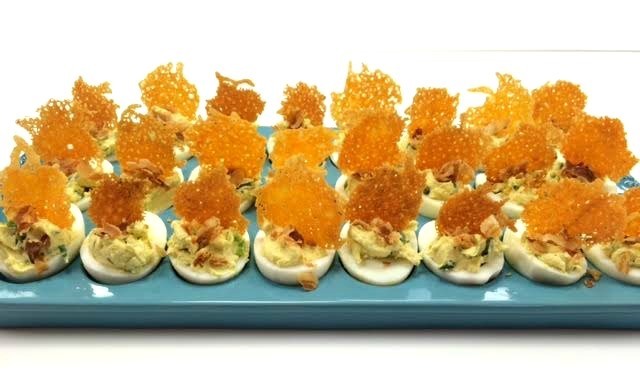 In my search, I came across a recipe for deviled eggs that I couldn't resist making. I whipped these bad boys up and took them to work for our office Thanksgiving and they seemed to bit a hit. I'm definitely making this recipe again this week to take to my in-laws. I highly recommend giving them a try! One thing that I really liked about this recipe was that the prep work can be done in advance. I boiled my eggs a day ahead so they had plenty of time to cool before I peeled them. I also made the cheese discs and crisp the pancetta the day before as well. All I had to do when I got to the office was assemble them. Enjoy! Recipe adapted via i am a food blog. 1. Add eggs to a medium size pot full of water and bring to a boil for 15 minutes. 2. Drain the water and allow eggs to cool before peeling. cooked, arrange on a paper towel to soak up excess grease. 4. Cut jalapenos down the middle and remove the seeds. Wipe out the skillet used for the pancetta and add the jalapenos, quickly searing on each side so they become softer. Remove from the pan once slightly cooked and dice. 5. Using the same skillet, sprinkle shredded cheddar cheese in tiny disks and cook until crispy and golden. 6. Gently remove the cheese discs from the skillet with a spatula and place on a paper towel to cool. 7. Peel the hard boiled eggs and slice them each in half. 8. Remove the yolks and place them in a medium size bowl. Mash until fine and crumbly. 9. Add to the crumbled egg yolk mixture, mayo, cream cheese, chopped green onions, diced jalapenos, garlic powder, salt and pepper to taste. 10. Fill the egg halves with the yolk mixture. 11. Top each egg with a little crumbled pancetta and top with a disk of crispy cheese. Cannot wait to try these! Hope y'all have a Happy Thanksgiving!